Old Capitol Books is your local new and used bookstore. We stock a wide selection of books – 35,000+ titles. Our selection of books on California history, military history, literature, science fiction, art, and children’s books is unsurpassed on the Monterey Bay. 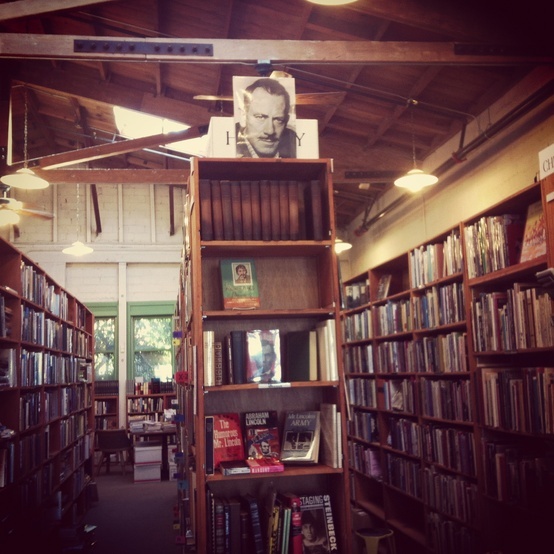 We regularly have a large selection of books by John Steinbeck and other popular authors, both classic and contemporary. We also have large sections for cooking, gardening, and other hobbies. We enjoy helping you find just the right book, whether you are looking for a specific title or need a recommendation. Or stop by to browse our shelves for unexpected finds and hidden gems! As an art and community space, we feature cards and artwork by local artists. We also host community events including reading and discussion groups, poetry readings and workshops, author events, music, and more! See our upcoming events or sign up for our monthly newsletter. We are very happy to announce that Old Capitol Books is under new ownership as of August 1st, 2017; it has been purchased by its employees, Ali Elfaki and Stephanie Spoto. In early 2017, when the owner Matthew Sundt announced to his staff that he wanted to sell, we knew that we had to do what we could to keep the bookstore open. To us, this bookstore represents something much more than a mere job – it is a real passion. Ali Elfaki is a Sudanese immigrant who grew up here on the peninsula, and has been working at Old Capitol Books since 2014. He’s looking forward to helping the bookstore grow and develop into a literary and artistic fixture in the community. Stephanie Spoto has worked at Old Capitol Books since its opening in 2012, and she is very excited to be a key part of its next chapter. We bonded over our love of books and literature, and many of our early days together were spent right here in the bookstore, so starting this next chapter of our lives together with Old Capitol Books is more than we could have ever hoped for. We are absolutely overjoyed. 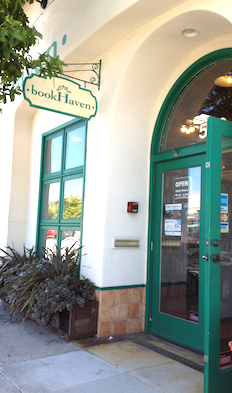 Matthew Sundt bought the Book Haven on October 12, 2012 from Guy Rodriguez and Jerry Welling who owned the Book Haven since 2004 (Guy and Jerry also owned Yesterday’s Books in Moss Landing from 1992-2004). Upon purchase of the Book Haven in 2012, the name of the book store was changed to Old Capitol Books, which reflects the name of Matthew’s family book store that was located at 639-A Lighthouse Avenue in New Monterey (now Gold Coast Tattoo across the street from Hula’s restaurant). Old Capitol Books was originally established in 1983 and was the Peninsula’s premiere book store for 20 years and now Old Capitol Books Redux! and now in downtown Monterey. Matthew captured the lingering palpable “goodwill” from Old Capitol Books and combined it with the swarm of Book Haven devotees to build his own bookstore style. One of the things that makes Old Capitol Books such a special place to be in is the building itself, with its high ceilings and beautiful wooden beams. The building was originally commissioned by Arthur C. Metz (b. 1879), a local real estate investor and Vice President of the Gross Canning Company, which flourished during the 1930s. The contractor who for the building was George C. Miller (b. 1875), from Gonzales, who used the newly constructed building as his shop. 1922 Seagraves tire change from hard rubber to pneumatic. Old Capitol Books is where the dark colored building is behind truck. 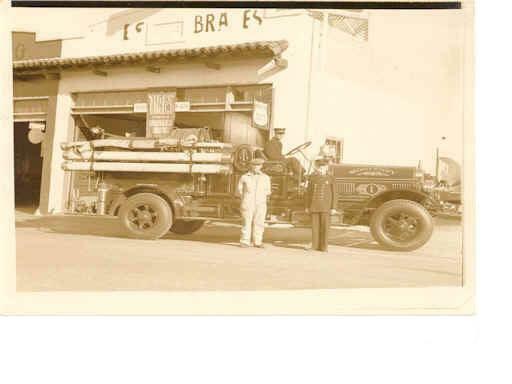 Downtown Monterey was heavily populated with auto related business from 1920’s to 1960’s. The structure was designed to serve as an automotive repair shop in what was once called the service area of Monterey, where one could get upholstery, radiator, and electrical repair and a new paint job for one’s automobile, all on the same street. These walls were the home of Bill’s Garage (1930-1937), Stoops Auto Repairs (1937-1947), Mission Motors (1947-1962), Tom’s Muffler Service (1963-1977) and Ernie’s Mufflers (1977-1978). The building was vacant and closed for remodeling and was reopened in 1981 as the Monterey Dance Studio, and was renamed Impulse Dance Wear and Dance Center in 1989. Two years later it became a martial arts studio under two different owners, Monterey Bay Karate until 1997 and then Korean Martial Arts until 1999 when the structure once again became vacant and underwent an earthquake retrofit. In 1999 the space found a new use, this time as a bookstore – The Book Haven. With its new paint, windows, and doors, soaring original wood ceilings and skylights it became the perfect place to house a large collection of books. In 2004, Guy Rodriguez and Jerry Welling bought the Book Haven and combined book stock from their book store in Moss Landing – Yesterday’s Books, with the existing stock, plus books from the original Old Capitol Books. Old Capitol Books is evolving. Watch us change and grow. The long term strategy is to be a bookstore for those looking for new books, used books, unusual books, cards, journals, magazine, newspapers, and for those looking for intellectual pursuits in the form of poetry and literature readings. We will continue to improve our stock and increase our presence in the literary community.